A year ago I had read and reviewed The Bible Code by Michael Drosnin. The Bible Code is the supposed discovery of a secret code in the Hebrew Old Testament which, by computer-enhanced mathematics, predicts almost every event in history. The book is popular enough to be sold at SAM’S warehouse and to frequent talk radio. Stanton does a good job of putting the major concerns with such a proposal into perspective. He shows how one could take any major piece of literature and, in the same way, find almost any message one wished to find. In a bottom-line way, either the Bible can be figured out mathematically or be accepted by faith. 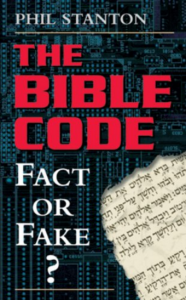 The authors of the Bible Code were not even Christian. Their desire for an easier way than faith is obvious.